Our Erik the Red Sword has an intricate etch-work patterns dress the blade, which is of 420 stainless steel and mirror polished. Forged with Marto’s world-renown quality, the Erik the Red Sword is a worthy and popular addition to any sword enthusiast’s collection. Decorative use only. Intended for wall decor, displays, home or office decor or for costume. The Emperor Frederick I Barbarossa (Redbeard) Sword by Marto of Toledo Spain has a tempered steel blade, ornated with 24K Gold engravings on its upper part. 43"
Our Marto Solomon Sword made by Marto of Toledo Spain a richly decorative sword has a Silver finish with Gold Inlays on the Hilt. The Marto Solomon Sword has a forged, fully tempered, polished stainless steel blade. Overall 47"
Our Marto Solomon Sword made by Marto of Toledo Spain a richly decorative sword has a Bronze finish with Silver Inlays on the Hilt. The Marto Solomon Sword has a forged, fully tempered, polished stainless steel blade. Overall 47"
The Sword of King Solomon pays tribute to this biblical kings's great spirituality and wisdom. The 47-inch sword has a 24K Gold plated hilt , handle and pommel that are wrapped in fine leather and accented with Silver plated medallions. The Templar Knight Silver Sword by Marto of Toledo Spain has a tempered steel blade with Silver etchings on the upper third with the Templar cross in black. Our Miniature Navy CPO Cutlass Letter Opener is a highly detailed scaled replica of the newly Board approved US Navy CPO Cutlass with blade etchings and metal parts. It even has a full stainless steel blade and matching scabbard (sized accordingly of course)! Finished in real 24K gold, this letter opener makes a great desk top display. The known history of the supposed Charlemagne’s sword in the Louvre began in 1270. That year, it was used at the coronation ceremony of King Philip the Bold. Experts disagree on the age of this coronation sword. The sword would have to be about 1,200 years old to have belonged to Charlemagne. Throughout history, swords have been used at every great event and have become imbued with great symbolism. This unique Freemason Masonic Sword contains a great many of the symbols used in the craft, particularly the compass and set-square, the plumb line and the hammer. This Sword of the Catholic Kings has and intricate etch-work patterns dress the blade, which is of 420 stainless steel and mirror polished. Forged with Marto’s world-renown quality, the Sword of the Catholic Kings is a worthy and popular addition to any sword enthusiast’s collection. This Sword of the Rome Gladius has an intricate etch-work patterns dress the blade, which is of 420 stainless steel and mirror polished. Forged with Marto’s world-renown quality, the Sword of the Rome gladius is a worthy and popular addition to any sword enthusiast’s collection. This Templar's Sword is made to honor the religious order of the Templar Knights. These ancient medieval knights were tasked with protecting travelers on pilgrimage and the Christian way of life. Features the symbol of the Order of the Knight Templar in the rounded pommel. This King Solomon Sword was crafted in honor of the King of Israel and the son of David. This highly detailed sword is made in Spain by Marto. The beautiful details feature engravings of the Star of David and the Ark of the Covenant. This historical and ceremonial sword has an unsharpened blade. Our Richard the Lionheart Sword has an intricate etch-work patterns dress the blade, which is of 420 stainless steel and mirror polished. Forged with Marto’s world-renown quality, the Richard the Lionheart Sword is a worthy and popular addition to any sword enthusiast’s collection. 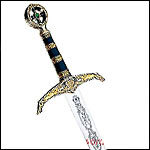 Based on the famous sword of the “Prince of Thieves” comes this magnificent blade. The hilt has a rich palette of antiqued silver and gold, with embossed ornaments of sword, stag and heralding trumpeter angels, all offset with its deep green stone and dark leather handle. This Sword of Charles V / Carlos I is a deluxe edition from Marto of Spain. It is one of the most spectacular swords in the history of Spain. Charles V, also known as Carlos I of Spain, was a Duke of Burgundy and Holy Roman Emperor. He was ruler of both the Spanish Empire from 1516 and Holy Roman Empire from 1519. The great Scottish hero, William Wallace, and his band of lowlanders bested a superior English force of 50,000 at Stirling Bridge in 1297. In his ongoing challenge of Edward I he also laid waste to several counties in the north of England. This Royal Sword of Edward of Woodstock, the Black Prince is from Marto of Spain. This beautiful replica has a fully tempered AISI 440 stainless steel blade with a fuller groove and etched with the words Eduardo de Woodstock. The Zamak grip is wire wrapped blue suede. This beautiful ornate replica from Marto of Spain has a double edged blade made of the finest tempered stainless steel, decorated with 24K gold engravings on the upper part. The cross guard decorated in gold and silver plated metal.